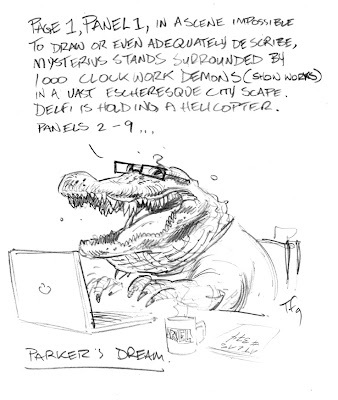 "@jeffparker Dreamed last night that @tomfowlerbug drew a picture of me, and when I saw it, it was an alligator. Interpret THAT"
Looks - and sounds - just like him. i know, right? it's the eyes, i think. the kind of eyes that say: "i could really go for some wildebeest right now..."
That would be a Crocodile. ...or a very ambitious alligator. don't sell yourself short, jeff, reach for the stars!!! This bodes well for the next series. Or terribly. One or the other.